You are viewing the archive for the ‘wine and das boot’ tag. Finally after years of planning in happy hours, an Iron Chef style food battle took place at the chairman Su’esh apartment. The idea for Iron Chef party stemmed from a similar battle with other fellow friends, Ja’on and H’ns. The name of the event was “Battle of the Blogs”. The challengers were myself from DesiGrub and Nick from Nickspalate. The chairman allowed both of us to invite maximum of 3 guests, one of whom can help as a sous chef. I wanted to invite many people but settled on inviting 3 family members, with my cousin as Ma’deep in my team as the sous chef. 1. Chairman will pick a single secret ingredient (can be generic that covers various varieties) that the chairman feel covers most cuisines. 2. Chefs will be given the secret ingredient and 2 hours to plan/shop at Harris Teeter and 7 Corners Grand Mart only and 2 hours to cook. 3. Everyone invited will be judges. Judging will be based on the cumulative total on 3 categories: Taste, Originality, Plating (both dishes in one plate, so I would recommend the dishes to complement each other). 4. Grocery bills will be paid for by the guests. After much anticipation, the secret ingredient was announced to both of us when we reached there. 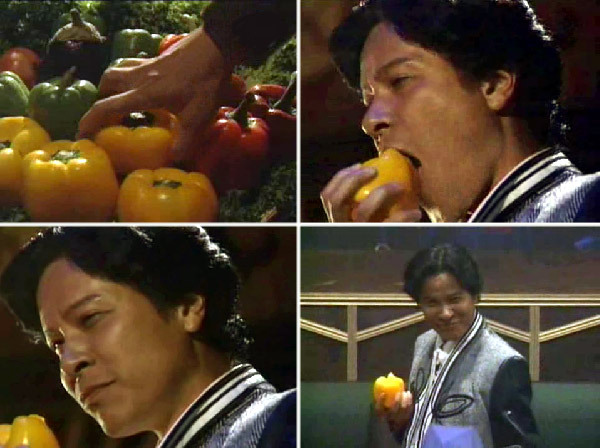 The secret ingredient was the original secret ingredient used by the Iron Chef Chairman, i.e., pepper – indeed a very clever choice. We started shopping at Harris Teeter because we believed that it will have more variety of pepper. Sadly, we reached there after the Sunday shopping crowd had nearly emptied the entire pepper section. We moved our shopping to the Giant. Nick already had menu planned and went start ahead to shopping. I, on other hand, didn’t have any concrete idea. I knew that I wanted peppers as the main ingredient and wouldn’t want to use other things such as meat that may overwhelm the flavor of the pepper. I pushed back and forth idea of dish with my sous chef. I wanted to make Ravioli but decided against it since we may not be able to make it within 2 hours. 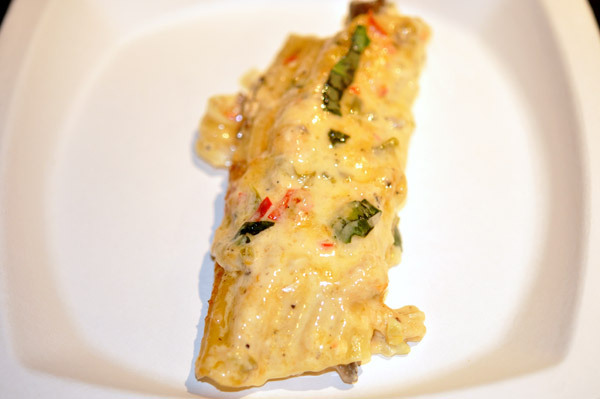 Instead, we settled for stuffed bell pepper-mushroom manicotti with jalapeños/red pepper Alfredo sauce. We were satisfied with the second dish but left the grocery store with unsettling feeling for the first dish. 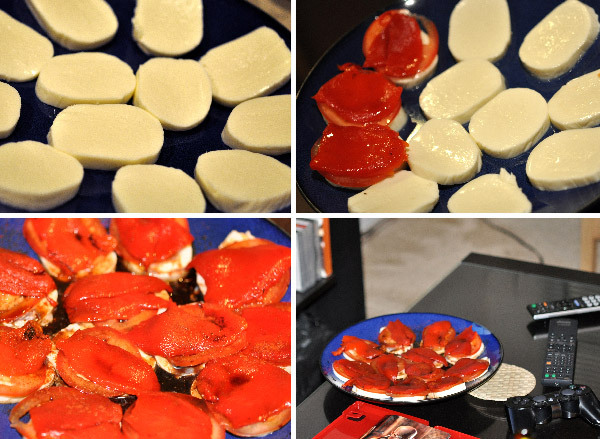 We wanted roasted pepper on mozzarella with balsamic vinegar. It seemed too simple but I didn’t want to use other bell pepper again or wanted to use meat. We also talked about sandwich but didn’t follow through with the idea. I wanted to keep Italian theme because most people don’t think of peppers when thinking of Italian food. I also got zinfandel wine to make wine infused pepper. Zinfandel wine with pepper. 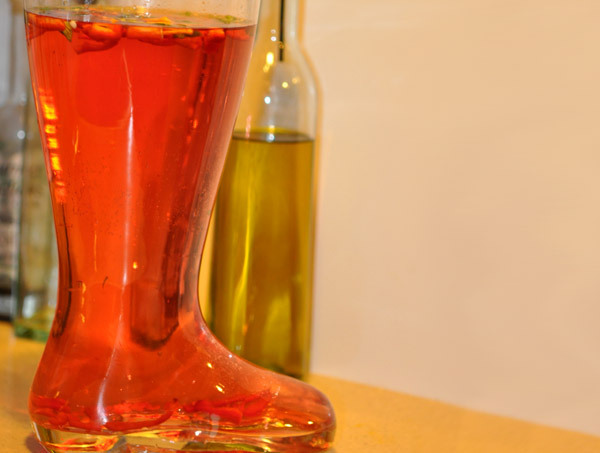 Chopped pieces of hot peppers were added to a sweet fruity zinfandel wine. The infused wine was let it to rest for couple of minutes for flavor of pepper to come out. I believe the sweet wine was perfectly balanced by heat from chopped hot pepper. The drink was inspired by hot conquistador drink. I served it right after the guests arrived. 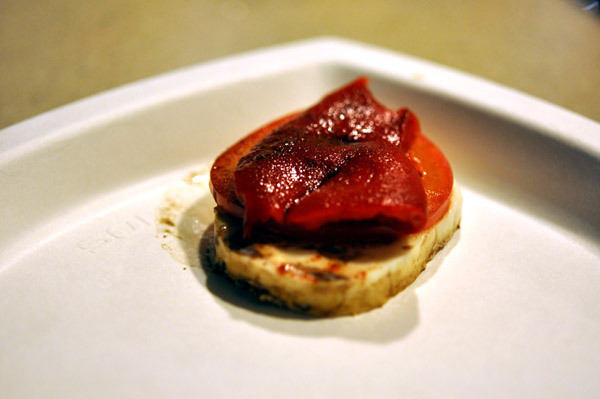 Slice of mozzarella, thin slice of tomatoes, roasted pepper drizzled with balsamic vinegar and sprinkled with paprika. The appetizer was too simple. I kind of got nervous thinking it was too simple. Even we were supposed to serve both things together, I decided to serve it right away because most people were starving and demanding the food. In retrospect I should have made sandwich/slider type entrée. I would have still not used meat or fish – just because they would overwhelm the taste of pepper. As I was serving my first dish, it dawn on me that it may not be enough and by rule I was supposed to serve two dishes on a plate. I wasn’t going to get any points for plating. I also thought same slice of mozzarella would be much better if served between a sandwich roll that have been glazed with pepper infused olive oil with roasted pepper sauce. The sandwich could be complimented by my infused wine drink. A better idea would be to make a mashed potato/bean and pepper based vegetarian burger sliders instead of mozzarella. Sadly, we didn’t get bread and there was no point crying over spilled milk. I knew the first dish served in rush was not the greatest but I was happy to feed hungry friends. I could perhaps made another dish but I thought it was somewhat unethical. After dishing out the first dish, we started focus on second. My sous chef had already made amazing Alfredo sauce with butter, cream, garlic, jalapeno pepper and red chili pepper with three kinds of cheeses; parmesan, romano (extra), asiago. 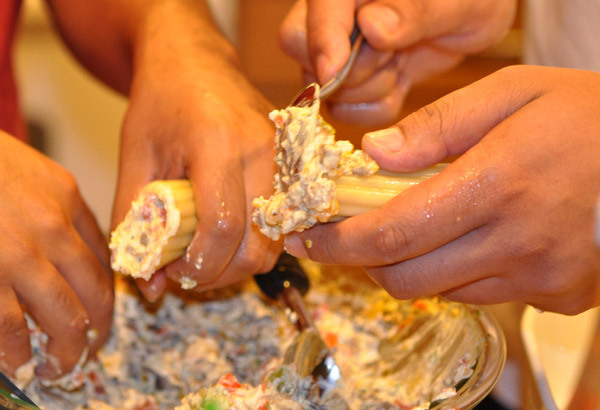 The alfredo sauce came out excellent and I would not hesitate to say that it was the reason Desigrub won. 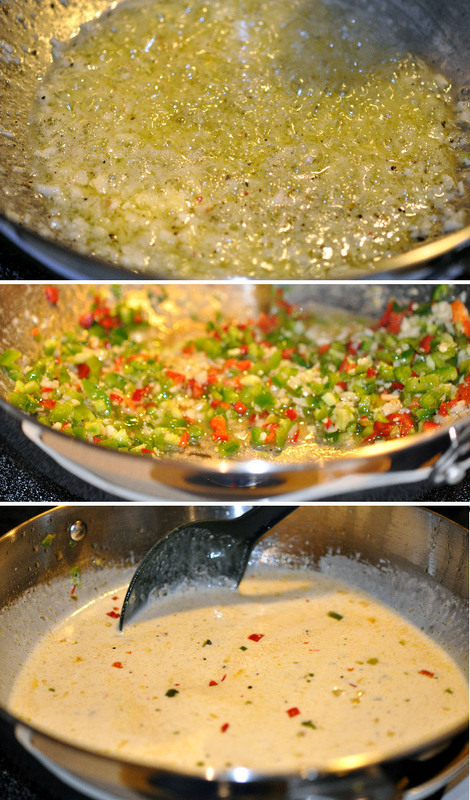 The stuffing was made by sautéing chopped mushroom followed by sautéing 3 types of chopped bell peppers. Ricotta cheese and salt were added later. Boiling manicotti that didn’t break seemed challenge at first. I have never made them before and ended up overcooking and thus breaking the first batch. Thankfully, I managed to pull off the second batch of manicotti. The dish came out right on time when people were hungry. I was happy with the dish in the way it was able to extenuate the flavor of peppers in what I considered a unique dish. My opponent Nick made duck with pepper sauce and stuffed pepper with ground chicken. I refrain from judging his food and hopefully other judges can chime in few nice words on his food in the comment section. 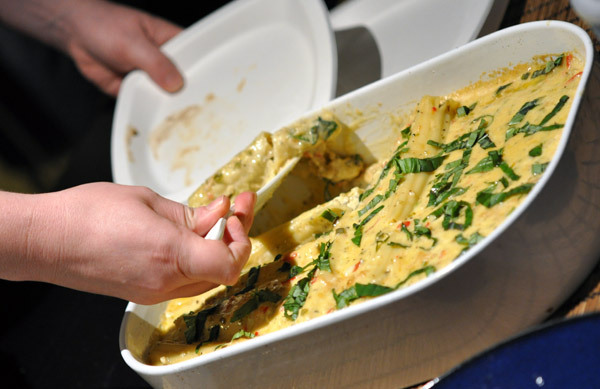 How to host an Iron Chef Party? I believe the chairman Su’vesh rules serves as a great roadmap for hosting an Iron Chef party in future. Only thing, I need to add is that the “taste” category should emphasize on how the taste of the secret ingredient is showcased by the dish and “creativity” should judge the novelty of the dish. Similarly, plating should be communal. It’s sometime impossible to plate 15 to 20 hungry people, most whom are starving and care more about eating than judging. For voting, the chairman discounted the lowest and highest scores for each party to discount any extreme personal biases people may have. A team led by the chairman took at least half an hour for deliberations. Even though the team DesiGrub won by 1%, I feel that it’s within margin of error. Both the winning dish, pepper stuffed manicotti, and the losing dish, roasted pepper appetizer, was made by my team. Next battle is looming on the horizon — I want to be chairman for the next time.